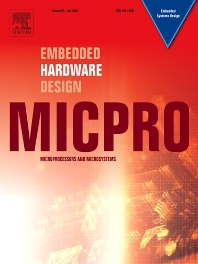 Microprocessors and Microsystems: Embedded Hardware Design (MICPRO) is a journal covering all design and architectural aspects related to embedded systems hardware. This includes different embedded system hardware platforms ranging from custom hardware via reconfigurable systems and application specific processors to general purpose embedded processors. Special emphasis is put on novel complex embedded architectures, such as systems on chip (SoC), systems on a programmable/reconfigurable chip (SoPC) and multi-processor systems on a chip (MPSoC), as well as, their memory and communication methods and structures, such as network-on-chip (NoC). Design automation of such systems including methodologies, techniques, flows and tools for their design, as well as, novel designs of hardware components fall within the scope of this journal. Novel cyber-physical applications that use embedded systems are also central in this journal. While software is not in the main focus of this journal, methods of hardware/software co-design, as well as, application restructuring and mapping to embedded hardware platforms, that consider interplay between software and hardware components with emphasis on hardware, are also in the journal scope.